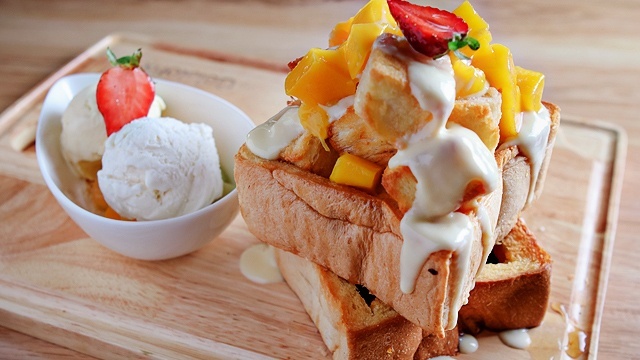 This restaurant will transport you to the streets of Ho Chi Minh. 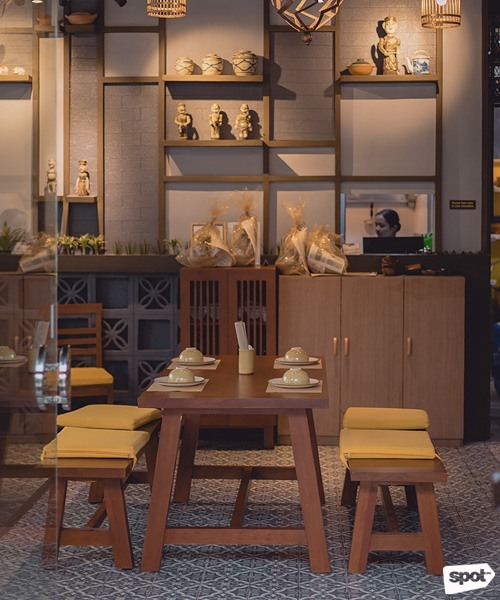 (SPOT.ph) Walking into Nha Em feels like entering someone’s home, from the wood banisters ingeniously used as wall décor to cushions on wooden benches that’ll help you settle down as you wait for your meal. It helps that Nha Em is located at SM Aura’s Sky Park so you also get a view of the rooftop garden and the city’s skyline. 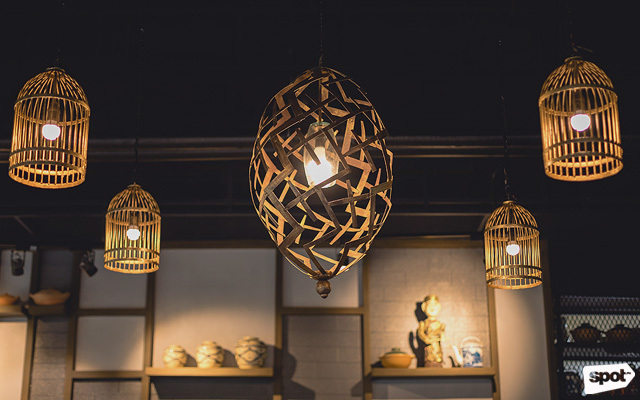 But it isn’t just any home—traditional water puppets, which resemble little wooden dolls, line the shelves as well as porcelain jars. It all feels very Asian, or more specifically very Vietnamese. It was quite a challenge, especially when you have to import almost all of the ingredients from Vietnam to bring in the flavors they tasted back in the country to Manila. (Exporting the fish sauce, for one, was non-negotiable.) Still, it all pays off, especially when you get to sample their offerings, which range from well-known classics like spring rolls and pho to less familiar-but-equally-promising banh xeo or Vietnamese crispy crepe. 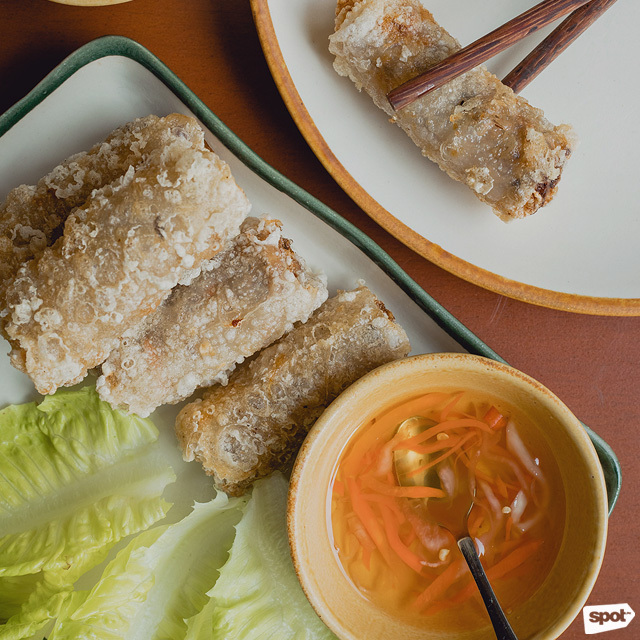 You can’t go wrong with having the Goi Cuon (P220) or fresh spring rolls for appetizers. 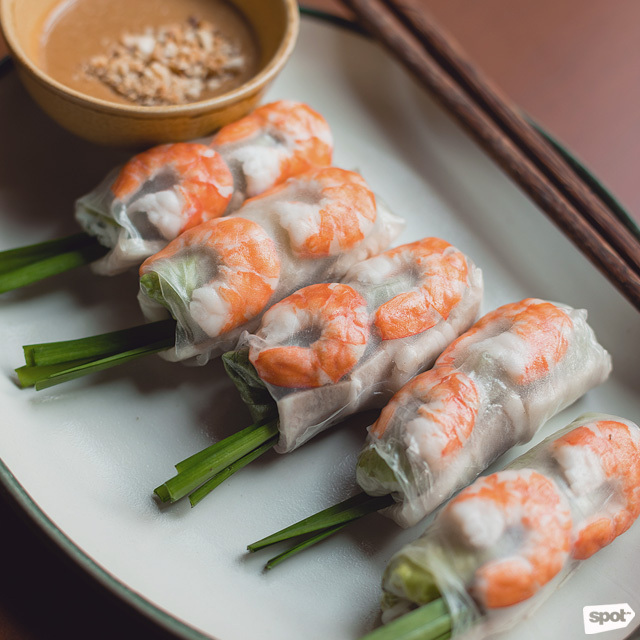 The rolls, stuffed with carrots, cilantro, steamed prawns, and strips of steamed pork belly, are light and fresh, and will whet your appetite enough without making you too full for the rest of the delicious things to come. The Cha Gio (P240) or fried spring rolls are great if you enjoy that extra crunch but just because it’s fried doesn’t mean it isn’t as fresh as ever. 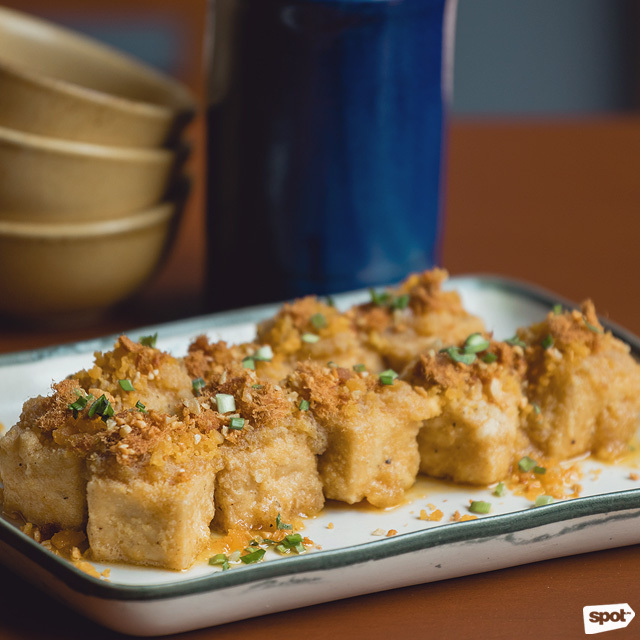 Another great appetizer is the Dau Hu Chien Trung Muoi (P260) or salted egg tofu. The salted egg coating is lip-smacking, with that familiar rich saltiness, but the crisp tofu keeps the dish from getting too overwhelming. 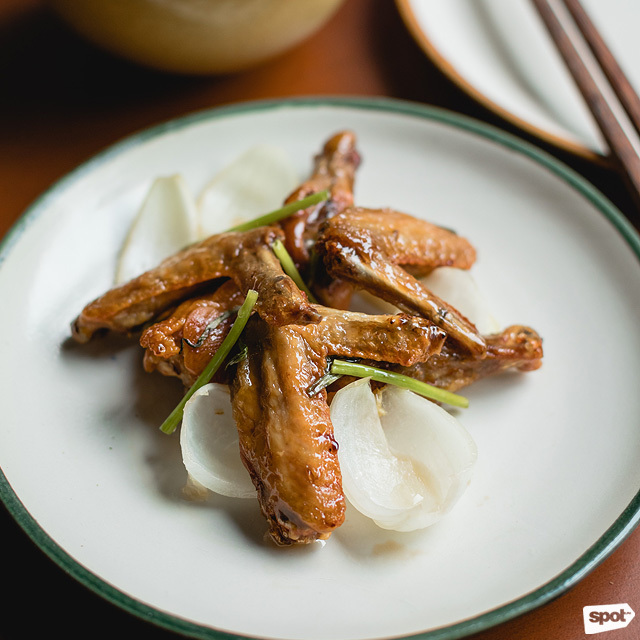 You’ll get why they had to import their fish sauce from Vietnam once you taste their Canh Ga Chien Nuoc Mam (P290) or fried chicken wings covered in fish sauce. The glaze has the kind of sweetness that’ll leave you licking your fingers clean, and the fish sauce adds a distinct flavor that’s not too salty and is actually quite citrusy, too. The Vietnamese fish sauce (or nuoc cham) makes a reappearance in the Thit Kho To Trung Cuc (P310) or braised pork with eggs. 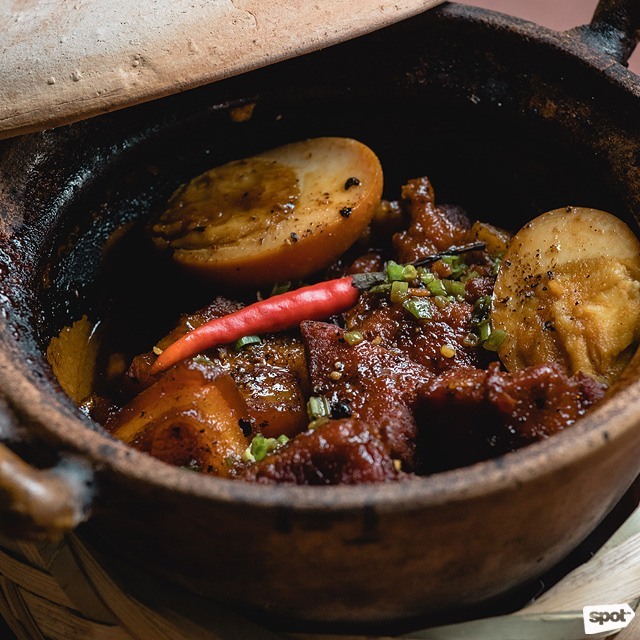 Melodee shares that they had to bring in the clay pots from Vietnam for this stew because any other pot would shatter from the heat. 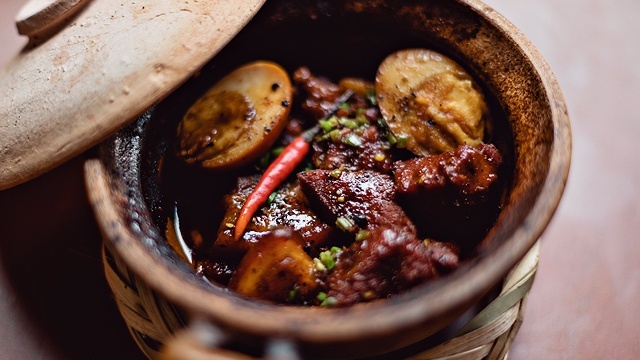 With tender pork and slices of hard-boiled egg, this stew will remind you of adobo, but the nuoc cham gives it that distinct sweet-sour-salty flavor profile that makes this novel to the palate. 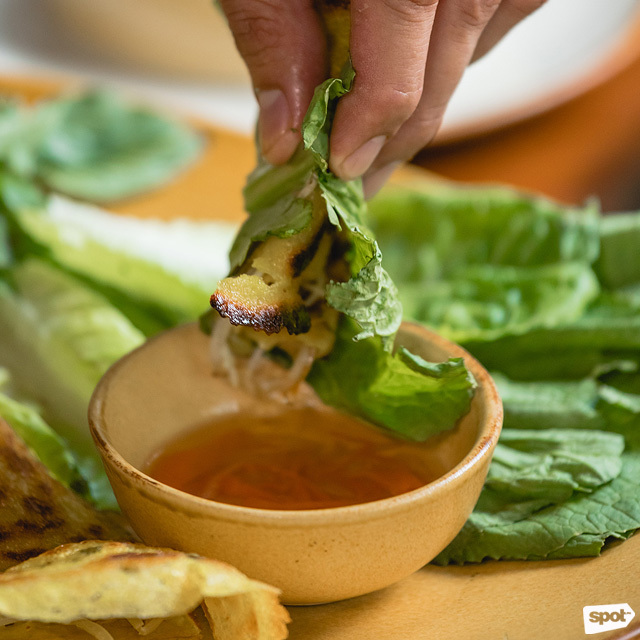 Don't forget to dip it in nuoc cham! 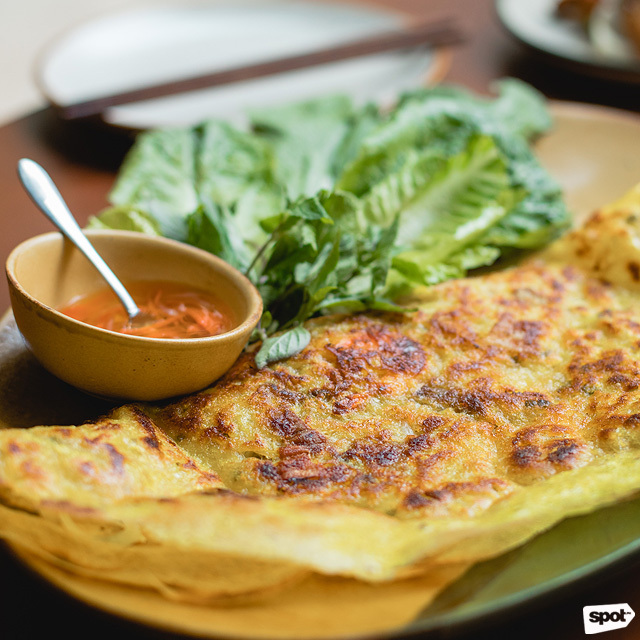 The Nha Em team is a big fan of the Banh Xeo (P350); it should be enough to let you know that this one is a must-try. 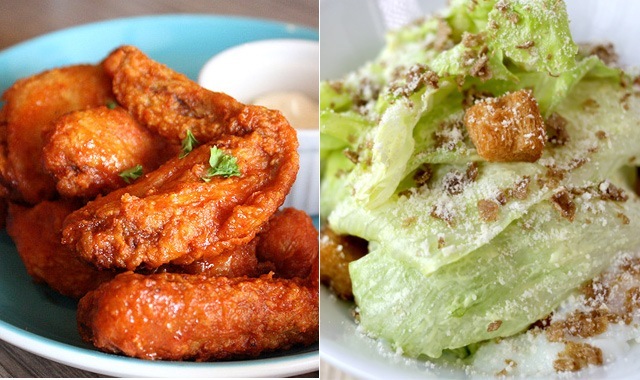 “It’s my all-time favorite,” shares Chef Kiko. “Malutong, masarap, and hahanap-hanapin mo 'yong flavor.” It’s described as a crispy crepe but it’s even thinner than what you’re familiar with, giving each bite a resounding crunch. There’s also a technique to eating this: First, grab a piece of mustard leaf, lay out a piece of the banh xeo, then roll it all up. It is, as the Vietnamese put it, a wrap-and-roll meal. There is a reason for the method, the mustard leaf adding that herby slightly bitter flavor to balance out the saltier crepe, which is stuffed with prawns, bean sprouts, mint leaves, and more. While Vietnamese food isn’t something new in the local food scene, it admittedly often hasn’t gone beyond the usual banh mi and pho. It’s great to find a restaurant dedicated to expanding our knowledge of the cuisine—plus it helps that they’re excellent at it. 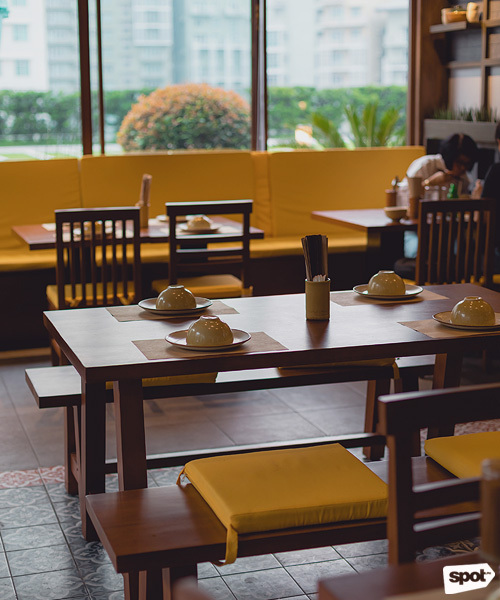 As Melodee puts it: “The best Vietnamese restaurant has to be us.” A lofty goal that certainly keeps them on their toes—good news for us, who now have more delicious Vietnamese food to feast on.